Knowledge describing the structure and function of the small regulatory human immunodeficiency virus type 1 (HIV-1) viral protein U (Vpu) has increased significantly over the last decade. Vpu is an 81 amino acid class I oligomeric integral-membrane phosphoprotein that is encoded exclusively by HIV-1. It can therefore be anticipated, that Vpu might contribute to the increased pathogenic potential of HIV-1 when compared with HIV-2 that has so far had a lower impact on the acquired immune deficiency syndrome (AIDS) pandemic. Various biological functions have been ascribed to Vpu: first, in the endoplasmic reticulum (ER) Vpu induces degradation of CD4 in a process involving the ubiquitin-proteasome pathway and phosphorylation of its cytoplasmic tail. In addition, there is also evidence that Vpu interferes with major histocompatibility complex (MHC) class I antigen presentation and regulates Fas mediated apoptosis. Second, Vpu augments virus release from a post ER compartment by a cation-selective ion channel activity mediated by its transmembrane (TM) anchor. The phosphorylation of the molecule is mediated by the ubiquitous protein kinase caseinkinase 2 (CK-2) within a central conserved dodecapeptide at positions Ser52 and Ser56 located in a flexible hinge region between two helical domains. Structural information, provided experimentally mainly by solution- and solid-state nuclear magnetic resonance (NMR) spectroscopy and made possible through the availability of synthetic and recombinant material, have shown that the biological activities of Vpu are localized in two distinct domains that are mainly confined to the C-terminal cytoplasmic and N-terminal TM domains, respectively. 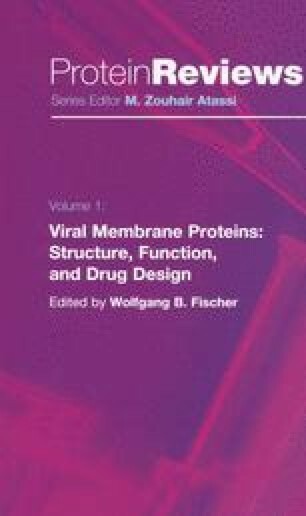 Similar to other small viral proteins that interact with membranes Vpu is a very flexible molecule whose structure is exceptionally environment dependent. It assumes it’s most structured form in the hydrophobic environment in or at the membrane. An initial 20–23 residue α-helix in the N-terminus adopts a TM alignment while the cytoplasmic tail forms an α-helix-flexible-α-helix-turn motif, of which at least a part is bound parallel to the membrane surface. Details of the arrangement of oligomeric forms of the molecule that are presumably required for the ion channel activity, are emerging from recent theoretical calculations, while this particular function is currently the area of pharmaceutical interest.